Home » BLOG » Teeth implants » How durable are dental implants? As we get older, the condition of our teeth can deteriorate even if we take care of them in an appropriate way. Conserving dentistry (treatments aimed at conserving the teeth) can extend the durability of our teeth by years. Howevever, it doesn’t have an everlasting effect if the structure of the tooth is already damaged. During its development, dentistry has come up with several solutions for prostheses. Dental bridges can replace lost teeth, but they require the grinding down of the adjacent, intact tooth. In case of serious tooth loss, the well-known, removable dentures are available with all their inconveniences. Then artificial teeth (dental implants) appeared on the market. 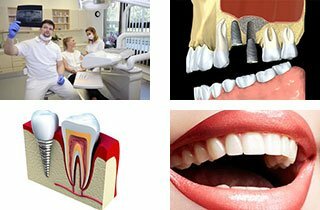 They represent a solid, safe, durable, aesthetic solution of tooth replacement. But some patients ask this question: are dental implants permanent? What does the success of implantation depend on? Is it possible that the organism does not tolerate the implant? Thanks to modern technology, today it is possible to produce tooth implants which are excellent from an aesthetic point of view, seem identical to real teeth and do not damage the intact teeth. This gives specialists almost unlimited possibilities to create aesthetic tooth implants. With appropriate lifestyle and throughout care of the teeth, the implant can stay in place for decades. The precondition for this is careful assessment and compliance with certain conditions. You, the patient are the one who can do the most to achieve this. Some factors can reduce the chances of successful dental implantation (ossification). Among these we can list smoking, regular consumption of alcoholic drinks and the lack of oral hygiene and gingivitis (which is partly caused by the aforementioned factors). These not only make implementing tooth implants more difficult or impossible, but can further ruin the condition of our teeth and destroy our appearance. If we think about getting tooth implants, we should be prepared for it and eliminate the aforementioned problems. Another obstacle can be the lack of bone substance in the jawbone. In this case, the patient will need bone grafting before the implantation. Before the intervention you will undergo an X-ray or a CT examination. This can reveal the potential lack of bone substance. This way your dentist will accurately assessed the condition of you jawbone and he will tell you the possible solutions. With the right preparation from both the patient and the dentist, this happens very rarely. Right preparation means getting rid of the aforementioned harmful habits (smoking etc) and to treat eventual gingivitis before the intervention. After the first examinations, your dentist will warn you about these and they will give you the necessary advice so that you can avoid the inconveniences. The dental intervention is a collaboration that requires a certain effort also from the patient’s side. It is why you will have to discuss everything thoroughly with your dentist in connection with the intervention. The metal part of the dental implant is made of titanium. This metal only rarely triggers an undesirable reaction in the organism. Therefore the high quality material and the professional detist guarantee success. The first tooth implantation which served as the basis for the current technology was performed in Sweden in the 1960s. This implant remained in the patient’s mouth until their death nearly 40 years later. Today’s technology offers almost limitless opportunities in the field of tooth implantation. The companies producing quality products have all reported a long term success rate of 90-95%. The implant itself can last for decades. However, the crown (the visible part of the tooth structure) will wear away after a time, depending on its material (usually after 10-15 years). However, these crowns are easily replaceable. The material itself guarantees the durability of the implant. There is usually a warranty of 10 years for them, depending on the manufacturer. After a successful implant intervention, you can keep your confident smile for decades if you have appropriate oral hygiene and regular dental check-ups . After many years of experience and implementing several thousands of tooth implants, our dentists guarantee success. Also for you.